Our tour begins today as we depart the USA and for Shannon, Ireland. Meals and beverages are served in flight. Upon arrival at the Shannon airport we are met by our friendly Pathfinders Tour Manager who escorts us to our motor coach. We begin with a panoramic tour of Shannon. After checking into our hotel, we head to Bunratty Castle for a tour and a medieval dinning experience. Overnight in Limerick. Today we enjoy a tour of the the breathtaking Cliffs of Mohr, rising almost 700ft above the Atlantic Ocean, and the Poulnabrone Portal Tomb. We then take a stroll through the seaside village of Galway. Finally we enjoy a taste of the “farm life” as we travel to Rathbaun Farms for teas and scones in their 150-year-old farmhouse. (http://www.rathbaunfarm.info). We return to Limerick for dinner and overnight. 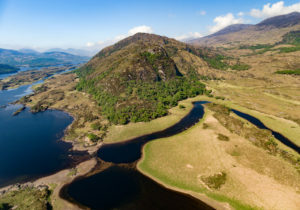 We depart Limerick today and journey to Kilorglin to experience the 100-mile panoramic drive around the Ring of Kerry. We end our day in the resort town of Killarney, where the rest of the day is at your leisure. Overnight in Killarney. 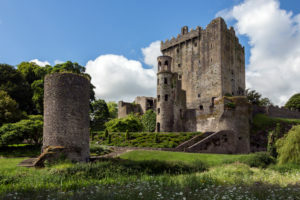 Today we start our day by heading to the Blarney Castle for a tour and the opportunity to kiss the Blarney stone in hopes of receiving the gift of eloquence! We then head to Rock of Cashel, where legend says St. Patrick plucked a shamrock and used it to teach about the Holy Trinity. Upon arrival in Dublin we check into our hotel and have time at leisure before dinner. Dinner and overnight in Dublin. 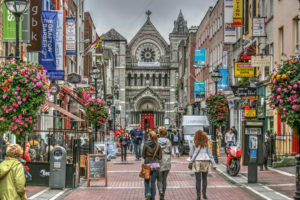 Our tour today includes a explorations of Dublin. We visit the famous O’Connell Street, St. Patrick’s Cathedral, Oscar Wilde’s House, Dublin Castle, Trinity College, and the Book of Kells. The rest of the day is yours to enjoy at] leisure. Overnight in Dublin. 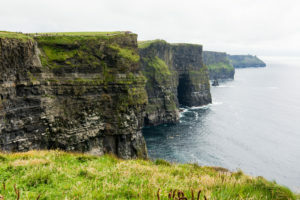 Today we depart Dublin and make our way to Armagh, the ecclesiastical capital of Ireland, and home of two St. Patrick’s Cathedrals (Catholic and Protestant). 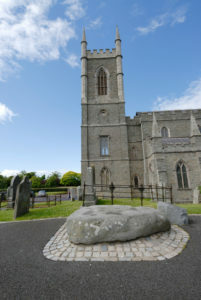 After a tour of the city, we visit Downpatrick, where St. Patrick first landed in 432AD and is believed to be buried. We then make our way to Belfast, where we enjoy a traditional Irish dinner in honor of our last night in Ireland. Overnight in Belfast. We begin today with a tour of Belfast including the Albert Memorial Clock, the Opera House, and the Titanic Experience. We then board our ferry heading to Scotland! Upon arrival we make our way to Glasgow for the evening. Dinner and overnight in Glasgow. This morning we enjoy a tour of Glasgow including the Merchant City, Waterfront, and Dumbarton Castle. In the afternoon we make our way to Oban for dinner and overnight. This morning we board a ferry to the Isles of Mull and Iona, known as the Cradle of Scottish Christianity. Founded by St. Columba in 583AD, we visit the restored monastery and cathedral, and walk through the historic graveyard. 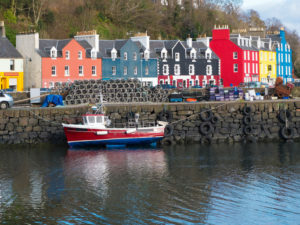 We return to Oban for dinner and overnight. Today we travel across Scotland to Edinburgh. Along the way we stop at Stirling Castle, one of Scotland’s most important fortresses. Upon arrival in Edinburgh enjoy ample time at leisure. Overnight in Edinburgh. 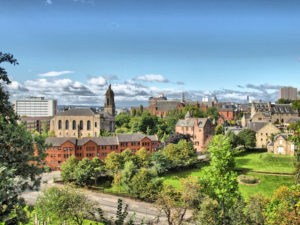 We begin today with a guided city tour of Edinburgh, visiting Edinburgh Castle and St. Giles Cathedral where John Knox , who launched the Scottish Reformation, was the minister from 1559 to 1572. This afternoon we travel to Lindisfarne to visit the Holy Island and view the magnificent arches of the abandoned priory and Lindisfarme Castle. We return to Edinburgh for dinner and overnight. Today we visit two important Reformation sites. St. Andrews was once the ecclesiastical capital and site of one of the early struggles in the Reformation. We then continue to Dundee and visit St. Peters Church, the church of the instrumental Robert Murray McCheyne in the Scottish revival of 1839. We return to Edinburgh for a traditional Scottish dinner and show. Overnight in Edinburgh. This morning we transfer to the Edinburgh airport for our flight home, taking with us wonderful and inspiring memories of our pilgrimage, which will be treasured and relived for the rest of our lives.